One of the most requested features after Gnutella support was dropped over BitTorrent has been the ability to Preview the contents of a media file while it’s being downloaded. 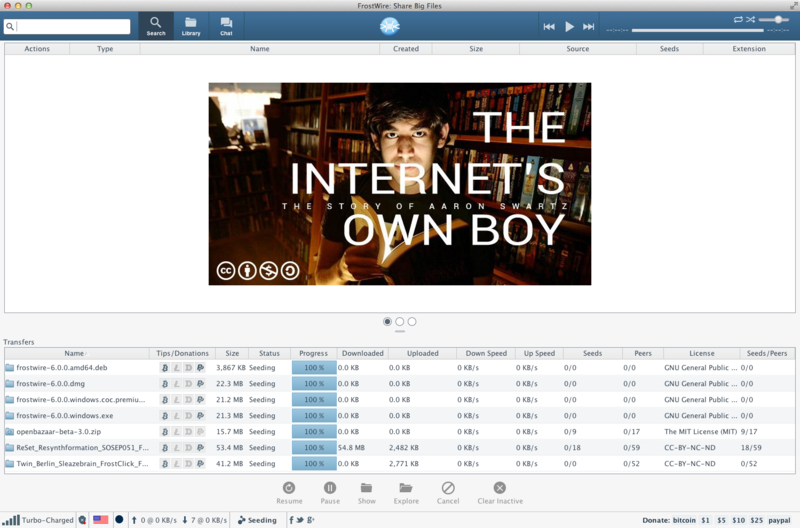 As of 6.0.7 FrostWire tries its best to collect download data to let you preview the file while it’s still being downloaded while not hurting the performance of the torrent’s swarm (sequenced piece fetching is done only for a very limited time or data amount depending on the download’s characteristics, once enough pieces are in for a preview the torrent resumes non-sequence downloading mode). Download Previews are also available for most cloud (http) downloads. Several search engine providers were fixed, including TPB and KAT, along with numerous upgrades and optimizations, including a refresh with the latest updates from the libtorrent project to make the torrent downloading experience the best out there. * New feature: Preview while you download. * Memory and CPU savings when parsing search results on some search engines. * Fixes run on startup issue on Windows. Thanks to @win32re. * Upgraded java virtual machine to 1.8.0_40 with hundreds of fixes and upgrades. * Upgraded H2 database engine. * Upgraded frostwire-jlibtorrent to the latest code from libtorrent. * UX-improvement: A repeated search will honor active search engines. * Fixes YouTube download Error. * Croatian translation updates. Thanks @win32re, @darthxjanus. * Polish translation updates. Thanks @nalesnikld, @paulinka. FrostWire 6.0.1 released. Available now for download. We can proudly say this is the leanest, and fastest FrostWire release we’ve ever made, and we’re only getting started with the performance improvements. The most fundamental upgrade about the 6.x series is the complete removal of the Azureus Torrent engine, we’ve replaced it with frostwire-jlibtorrent, a Java wrapper of the powerful libtorrent library. The performance benefits are very palpable on search, downloads and other aspects of the application. Having Libtorrent under the hood will allow us to continue working on the enablement of advanced features for expert BitTorrent users. We’d like to invite everyone out there to benchmark FrostWire 5.7.7 against FrostWire 6.0.0 and let us know what they find, we’d love to make FrostWire 6 superior in every respect to the FrostWire 5 series. Contributors are needed to keep moving the project forward at a faster face, we are now converting donations received into bitcoins which are deposited into a “Tip for commit” fund. All the contributions accepted into the project automatically trigger tips to the authors in bitcoins. Anybody can help, you don’t need a bank account, or paypal account to receive your tips, all you need is a free Bitcoin wallet which is software you can download to your smartphone or PC, tips are effective immediatly after contributions are merged to the frostwire-desktop, frostwire-common, frostwire-jlibtorrent, and frostwire-android projects. 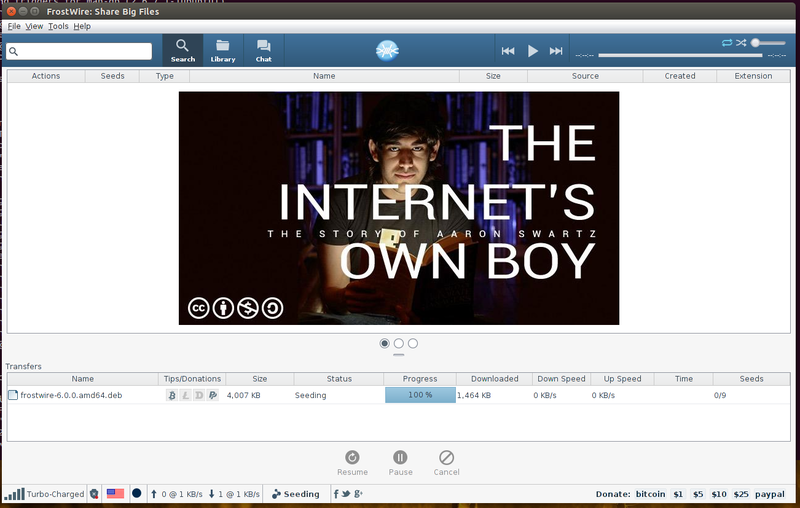 New BitTorrent engine based on frostwire-jlibtorrent, a libtorrent wrapper api created by FrostWire. Improved OS event handling in MacOSX. Fixes issues opening .torrents and magnets outside of FrostWire. Icons, buttons and other user interface details refreshed. Russian translation updates. Thanks @X-NicON. Croatian translation updates. Thanks @win32re, @darthxjanus. Polish translation updates. Thanks @nalesnikld, @paulinka. Simplified Chinese translation updates. Thanks @eudaemon01. German translation updates. Thanks @paulinka.